Robert Knight was driving the back roads of New Zealand when he came to this beach on the east coast of the North Island. "The thing about New Zealand is you can come across a beach that's miles long and there's no one on it." D5, AF-S NIKKOR 24-70mm f/2.8G ED, 1/250 second, f/10, ISO 100, manual exposure, Matrix metering. During the years that Robert Knight was building his notable career as a travel photographer, there was a pretty serious rival for his photographic attention and efforts: the siren song of rock and roll. In fact, the music might have had the edge, but the problem was, he couldn't make a living at it. Travel, on the other hand, was a very different story. Fortunately, he was able to succeed at both. The story of the two loves of his imaging life begins in paradise. Goldfield, Nevada, was and still is a gold-mining town. Among its other attractions, Robert lists "miles of old buildings, old cars, trains and strange things just buried in the sand or sitting there rusting away." D800, AF-S NIKKOR 24-70mm f/2.8G ED, 1/250 second, f/9, ISO 100, manual exposure, center-weighted metering. Looking into and through an unoccupied building at Goldfield. D800, AF-S NIKKOR 24-70mm f/2.8G ED, 1/250 second, f/11, ISO 100, manual exposure, center-weighted metering. "As a teenager," Robert says, "growing up in Hawaii, I didn't like it there." Wait, what? Someone who didn't like living in paradise? "I didn't surf. I didn't go to the beach. And it was hot," he says by way of explanation. "There was nothing to do. Think about it: you're on an island and you don't like water." So he spent a lot of time at the airport, watching planes take off. Makes sense—you're not happy where you are, why not imagine yourself leaving? "That was my entertainment," Robert says. "I'd take the bus to the airport, and in my head I'd fantasize going to exotic places." One day, leaving the airport, he found near a trash can a copy of the OAG—the official airline guide. "It contained the schedules of every airline in the world," he says, "and there was also a parallel book that listed the routes and fares. I studied all of it and imagined the trips I'd take, and how I'd connect in this city with this airline at this airport, and all that sort of stuff." It was all fantasy, all dreams, until one day in 1966, The Rolling Stones came to Hawaii on the last leg of an American tour and changed Robert's life. "It was the mid-60s, I was a kid, and I had only one thought: I've got to figure out how to get to London." But first he had to get to Oregon to see his grandparents, so he walked into a travel agency and showed the agent how he could make all the first-class connections there and back for less money than the cost of coach. "The guy said, 'You need to work here.'" Six months shy of 16 years old, Robert took the job. He worked after school and on weekends and eventually earned himself a first-class ticket to wherever in the world he wanted to go. Of course he chose London, and spent the summer there. In London there was a movie...it was called Blow-Up...and Robert's life changed again. "It was, Well, I don't play guitar, but photography is something I can probably do." When he came home to Hawaii he got a job caddying at a country club until he had enough money to buy a Nikon camera and three lenses. "In my mind, you couldn't be a photographer without a Nikon because David Hemmings used a Nikon in Blow-Up." With all the pieces in place—travel, rock and roll, Nikon—Robert headed for San Francisco. "I had to go to college, of course, but I'd read that Bill Graham was going to have every one of the bands I loved and wanted to photograph playing Fillmore West. So I looked into it and found out there was a school called the San Francisco Art Institute, and that's where I went." In San Francisco there were classes and concerts. "I was shooting all the time. I'd buy a ticket, walk in and people would get out of my way—I had the camera, right? I'd go right up to the stage, there was Jimi Hendrix, and I'd shoot. That's how it was then. I had no clients, it was just for myself. I think once I got $50 to shoot a Grateful Dead poster." Eventually he got Rolling Stone to send him to Los Angeles to photograph Led Zeppelin. "I wasn't old enough to get in, so I came in with the band as road crew." Of course he did. That's how it was then. At a Mayan ruin in Cozumel, Mexico. "It's a pretty large lizard," Robert says. D100, AF-S VR Zoom-NIKKOR 70-200mm f/2.8G IF-ED, 1/45 second, f/5.6, ISO 100, aperture priority, spot metering. Robert used a tripod for this image of a waterfall at Kaukapakapa, New Zealand. D5, AF-S NIKKOR 24-70mm f/2.8G ED, 4/5 second, f/22, ISO 100, aperture priority, Matrix metering. 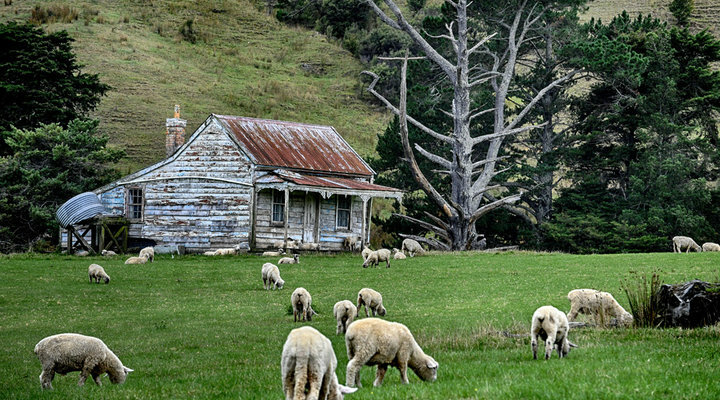 A sheep ranch not far from the Kaukapakapa waterfall. The old house now serves as a barn. D5, NIKKOR 70-200mm f/2.8G ED VR II, 1/250 second, f/16, ISO 500, manual exposure, Matrix metering. Muriwai Beach, near the Muriwai Gannet Colony on the northwest coast of the North Island of New Zealand. D5, AF-S VR Micro-NIKKOR 105mm f/2.8G IF-ED, 1/200 second, f/11, ISO 200, manual exposure, center-weighted metering. Piha, on the west coast of the North Island, is a famous black-sand surfing beach. Crashing waves create the mist between the mountains. D5, AF-S VR Micro-NIKKOR 105mm f/2.8G IF-ED, 1/250 second, f/13, ISO 100, manual exposure, center-weighted metering. Robert knew his passion was photography, but there was no money for him in rock and roll photographs—the name-brand shooters lived in Los Angeles and had contracts with the record companies—so he quit school and went back to Hawaii, where there was money in tourism photography. "I had the photographic skills, and I went to work shooting for hotels. I probably shot every hotel in Hawaii twice or three times over." First he connected with a hotel chain, then with an ad agency, then visitors' bureaus, then airlines and cruise lines and...well, you get the idea. All the while he was still shooting concerts—for himself, sometimes for a free Hawaiian magazine. "Between 1970 and 1980 I think I shot every concert that came to Hawaii. I knew the promoters and actually worked with them, suggesting bands and taking care of the bands when they came to Hawaii. But the only income I was making was from shooting travel all over the world." But whenever possible he'd plan his schedules to coincide with concerts and club appearances. "When Led Zeppelin or Jeff Beck was in London, or wherever, I'd be there." Over the years he created an incredible archive of images of rock, jazz, folk and blues musicians. Equally incredible, he owned everything he shot, and when he met an agent who offered to represent him, the gallery shows of his music photographs began to happen. "The music stuff started to become relevant," Robert says, and he got more and more into the music world with magazine covers, commercial sales and assignments. He even became a tour photographer for select bands. Coming soon is the rock and roll wine-bar club he and his wife, the photographer Maryanne Bilham, are opening in Auckand, New Zealand. "It'll have our rock photos on the walls, and it'll be a venue for young and emerging bands. I'm working with young bands and managing some as well." His travel photography these days consists of the images he makes while traveling with Maryanne. Some of them could end up in a book of his travel images that's now in the works. Maybe some will make an appearance at the Auckand club, you never can tell. The pieces are still in place—travel, rock and roll, Nikon. In any case, the beat goes on. An old schoolhouse in the Fruita area of Capitol Reef National Park, Utah. Robert converted the image to black and white, then added a bit of tone. D5, AF-S NIKKOR 24-70mm f/2.8G ED, 1/100 second, f/11, ISO 100, manual exposure, center-weighted metering. "We were driving from Las Vegas and passing a lot of old buildings on the way. This one was in Boulder, Utah, a burgeoning artist community where they've saved some of the old buildings and artifacts—which makes it a natural for photographers." D5, NIKKOR 70-200mm f/2.8G ED VR II, 1/125 second, f/11, ISO 100, manual exposure, center-weighted metering. Red Canyon, Utah. "It's the place you go through on your way into Bryce Canyon National Park—it's sort of a mini Bryce, with attractions of its own—like the way the sandstone has weathered and eroded." D5, AF-S NIKKOR 24-70mm f/2.8G ED, 1/125 second, f/14, ISO 100, manual exposure, center-weighted metering. Robert Knight likes to keep it to the basics: two bodies (currently the D5 and a back-up D800) and three lenses (these days they are the AF-S NIKKOR 16-35mm f/4G ED VR, the AF-S NIKKOR 24-70mm f/2.8G ED and the AF-S NIKKOR 70-200mm f/2.8G ED VR II, though he has added an AF-S VR Micro-NIKKOR 105mm f/2.8G IF-ED, mostly for portraits and close-up work). Robert's suggestions for the most effective travel photos come from the realities of his assignments: take pictures that make people want to pay a visit. You might call those images "blue sky photos"—no bad weather, few if any clouds in the sky. You can view Robert's images at his website, robertmknight.net, and at knightbilhamphoto.com, where you can also see images by his wife, Maryanne Bilham. His book, Rock Gods: 50 Years of Rock Photography, was published in January, 2018.